A no-frills, darkroom guidebook on a variety of experimental techniques. Compiled over the years by Anderson from classes taken and taught, it is filled with helpful hints. She covers cliche-verre, reticulation, cross-processing and the Mortensen metalchrome process. The book is spiral-bound to lay flat in those cramped darkrooms. 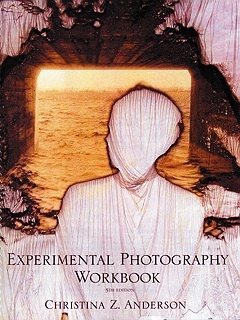 The strength of this workbook lies in the thousands (literally) of hours of research and compilation to bring together, in one place, information on all kinds of photographic experimentation. Each process covered is explained briefly yet fully enough. This encourages more immediate exploration into experimentation. I like to term the workbook the "Cliff Notes" of experimental photography. Non-silver processes and digital photography are not covered in this workbook, although they may be touched upon occasionally. What this workbook encourages is exploration into ways a photographer can "mess with" straight photography - ways a photographer can have fun in the darkroom. The workbook is designed to include enough processes to be accomplished in a typical semester of work at a university, if each week the student is given a menu of choices. The workbook is also perfect for workshop format where a number of the processes can be chosen. A word about experimentation: it is of utmost importance to enjoy the process and not seek an end product of perfection. Desiring perfection at the start is a killer for creativity! Going with the flow of process, with no specific outcome in mind, allows for creative energy to grow, and new discoveries to be made. When you think of it, how many experimental processes were born from "mistakes"? Let go of perfection and have fun playing. One last word of advice: be open minded enough to try all the processes. If you hit a brick wall with one process and you feel frustrated, put it aside for the time being and try something else. Don't abandon it permanently, telling others "it doesn't work". It may not have worked for you at that particular time, but at a later date, having tried it and filed the process experientially in the back of your mind, you might have your "Eureka!" moment where the process falls into place. Ultimately there will be several processes that will appeal to you more than others. Take them and run with them. The entire workbook is designed to provide you with tools you can use to better express the content and creativity you have inside. Happy creating! Christina was born into an eclectic family in Baltimore, Maryland, with a scientist father and an artist mother. She had the fortune of being the youngest of seven girls and one boy. Such a large family spurred her interest in people. Such a large number of women influenced her interest in female culture. With excellent schooling as well as early encouragement in the arts, creativity was a way of life in her family. Christina's first degree was in French from the University of Minnesota, where she also took art classes. She discovered photography in 1996 when pursuing her painting degree. Graduating with a degree in painting and photography then, she taught at Montana State University in Bozeman for 3 years, before attending Clemson University in South Carolina, from which she received her MFA in May 2005.